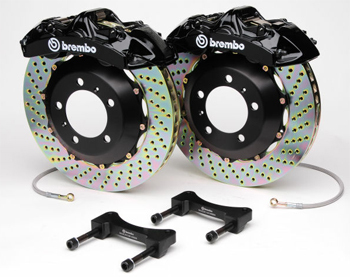 Get the ultimate brake system upgrade for the VW MK6 GTI by upgrading your brakes to the Brembo Big Brake Kit. 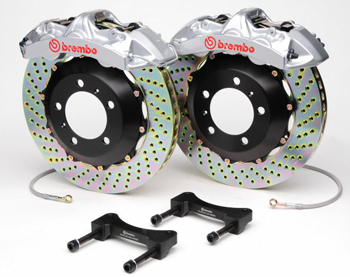 The Brembo Big Brake Kit for MK6 VW GTI dramatically improves braking performance for the street or the track. If you are looking for the ultimate in braking performance for the MK6 VW GTI, then you need to upgrade the factory braking system with the Brembo Big Brake Kit. Whether you are driving your GTI on the street or the track, the Brembo Big Brake Kit will dramatically improve stopping distances. 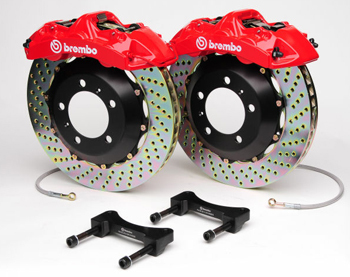 The larger brake components of the Brembo Big Brake Kit gives your car more brake consistency and better brake modulation which results in better handling on curvy roads and on the track. The rotors are available in slotted or cross-drilled depending on what your taste is. 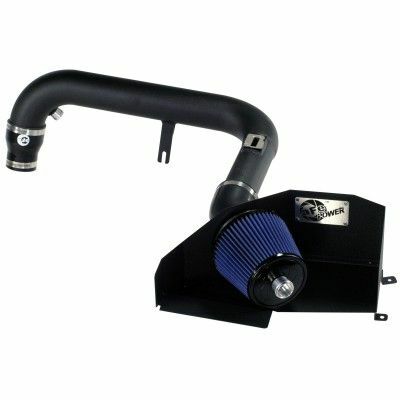 Not only will this brake make the VW MK6 GTI perform a lot better, it will also add a sporty, more aggressive styling to your car as well especially if you have aftermarket wheels where the brakes are more visible. For an extra styling touch, the Brembo Big Brake Kit for MK6 GTI is available in black, red, or silver finishes.